These spacious and modern rooms are located on the first three levels and feature a balcony with stunning views. They are equipped with a rainfall shower, high-quality bed sheets, a flat-screen television with cable programming, high-speed Wi-Fi, a mini-fridge and much more. $ 432	1 Room Total 4 Nights $ 1,728Taxes and fees not included. These spacious and comfortable rooms are exquisitely decorated and feature a balcony with incredible views. They are located on the levels 4th to 11th and are equipped with a rainfall shower, high-quality bed sheets, a flat-screen television with cable programming, high-speed Wi-Fi, a mini-fridge and much more. They also offer access to the wet areas of the spa and a beach bag. $ 447	1 Room Total 4 Nights $ 1,790Taxes and fees not included. These exclusive suites are located on the levels 7th to 11th and are equipped with a rainfall shower, high-quality bed sheets, a flat-screen television with cable programming, high-speed Wi-Fi, a mini-fridge and much more. 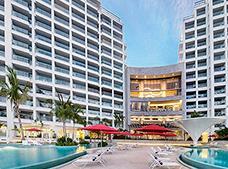 They also offer access to the Grand Club, reservations at the pool cabanas, Beach Club and Divina Sky Bar. When you book this category you get special privileges at selected nightclubs in the city. $ 463	1 Room Total 4 Nights $ 1,852Taxes and fees not included. These comfortable rooms feature modern and exclusive decoration, as well as a balcony with beautiful views. They are equipped with bathrobes, a beach bag, a mini-fridge and much more. They also offer access to the Grand Club Lounge (level 13, tower II) and the Balinese beds by the pool. $ 541	1 Room Total 4 Nights $ 2,162Taxes and fees not included. These comfortable rooms feature modern and exclusive decoration, as well as a jacuzzi. They are equipped with bathrobes, a beach bag, a mini-fridge and much more. They also offer access to the Grand Club Lounge (level 13, tower II) and the Balinese beds by the pool. $ 587	1 Room Total 4 Nights $ 2,348Taxes and fees not included. These comfortable suites feature a living room, a dining area, a separate bedroom and a large terrace with spectacular views, as well as bathrobes, slippers, welcome amenities, a beach bag, access to the wet areas of the spa and Resort Credit. They also offer access to the Grand Club Lounge (level 13, tower II) and the Balinese beds by the pool. $ 665	1 Room Total 4 Nights $ 2,659Taxes and fees not included.